I think many of you have strugled or are now struggling on how to get the Offline Address Book distributed to all CAS servers. When you try to add a new server to the OAB and you already have a large number of servers in the list of virtual directories it can be quite a pain from the Exchange management console. It also cost me quite some time to come up with a decent script that was capable of retrieving all the virtual directories and add them to the OAB. And if you have multiple different Offline Address lists the script might still be useful, see below. But today I found out that if you want your OAB to be distributed to every CAS server hosting an OAB virtual directory, a new parameter will simplify your life. 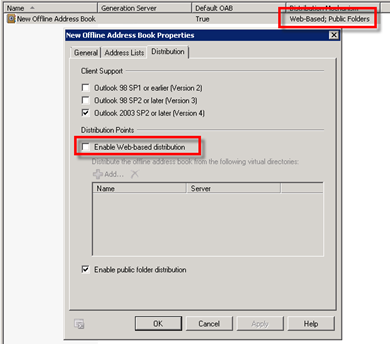 This parameter was introduced with Exchange 2010 and automatically will distribute the OAB to each server. The parameter I'm talking about is GlobalWebDistributionEnabled. The syntax is simple using the following cmdlet. Now when you open the OAB from the Exchange Management Console you will notice that "Web-Based" is listed as a distribution method but not when you open the distribution tab of the property screen. When you want to add a virtual directory manually you will be prompted with an error stating that you can't due to the globalwebdistribution setting. The nice part of this setting is, you can now set and forget about updating the virtual directories list. Here is the script I previously used to update the virtual directories, use it at your own risk. #add all virtual directories to the offline address book.